In the past few weeks I’ve been trying out different granola recipes in search of that perfect one. I’ve been looking for one where tasty meets healthy meets sustainable meets a touch of the unexpected. I believe that the recipe I’m about to share has it all. Granola is traditionally made mostly of oats so make sure you get the right type – it’s Jumbo oats, or rolled oats, that you want (as opposed to porridge oats). They have much nicer, firmer structure and they make granola taste crunchier when baked. 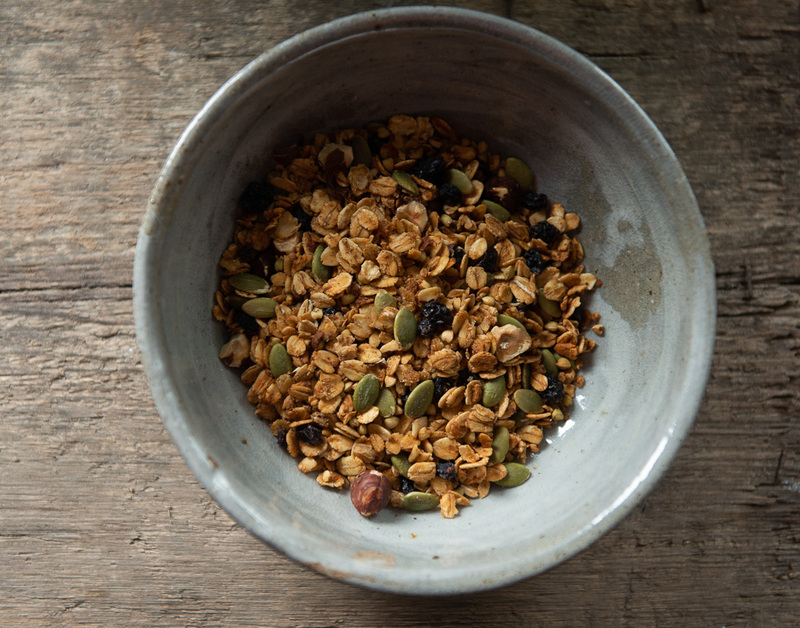 My love for buckwheat knows no bounds and so I included them in my perfect granola recipe. Other than being a nutritious addition to this breakfast classic, these little seeds add a degree of extra crunchiness to it. Plus it gives off hints of honey when being baked that are worth staying in the kitchen for. For sweeteners I chose honey, as nothing really beats honey for me. It’s tasty, it has some health benefits and you can get some from a local beekeeper, farmers market or even a supermarket. Plus it’s a cheaper alternative to maple syrup from a faraway land (I live in Wales). Finally, the fats. Cold-pressed rapeseed oil is a winner for me, as I can find one that is produced in Wales, and it’s a much more affordable option than coconut oil. Also it is one of the cooking oils that stays stable when heated. For discussion on cooking oils see this. For nuts I chose hazelnuts as they tick lots of boxes for me. Tasty? Check. Unexpected? Check. Sustainable? Well, sustainability is such a contested subject where business interests, farmers, and believers in certain diets try to outvoice each other and it’s difficult to find one truth to hold on to. In theory hazelnuts are one of those nuts that could be grown in Wales. You can find it growing wild on a smaller scale. The ones that can be bought are usually exported from Southern Europe. Lastly, I chose dried blackcurrants to bring fruity flavours into my granola. It is an underappreciated fruit, that can be grown in colder climates with good success, as opposed to overly sweet raisins usually cultivated in the South. This granola is so good I actually enjoy eating it dry. I love tasting all the flavours- it’s salty, sweet, bitter and sour without one flavour dominating the pallette. Add oats, buckwheat, sea salt, cinnamon, nutmeg to the bowl and mix. Measure honey and oil and pour it in a cooking pot. Heat it up to make into a uniform mass and mix it into the bowl with oats. Spread the mixture on a baking tray. If you like your granola chunky, with bits of oats sticking together, press it with a spoon to compact it. Put it in the oven and bake for 15 minutes. It’s important not to add nuts or seeds at this point as they might burn. Take it out and add nuts and pumpkin seeds. Don’t mix your granola if you like it chunky. I prefer it non-chunky and so I mix it. Bake for another 15 minutes. Turn the heat off, and leave granola in the oven. The oats might still not feel as crispy, but it will definitely crisp up as it cools down. When granola has cooled down, add blackcurrants. It’s important to add any dried fruit after baking, as otherwise they will harden.